Daisaku Ikeda (池田 大作, Ikeda Daisaku, born 2 January 1928) is a Buddhist philosopher, educator, author, and nuclear disarmament advocate. He has served as the third president and then honorary president of the Soka Gakkai, the largest of Japan's new religious movements. 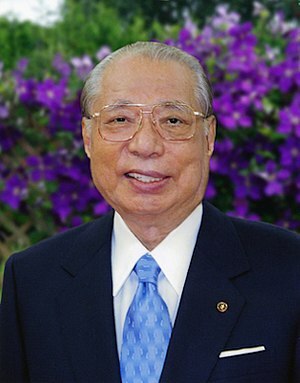 Ikeda is the founding president of the Soka Gakkai International (SGI), the world's largest Buddhist lay organization with approximately 12 million practitioners in 192 countries and territories. ↑ Dayle Bethel (1974). "The Political Ideology of Ikeda Daisaku, President of Soka Gakkai". International Education. 3 (2). ↑ Jason Goulah; Takao Ito (2012). "Daisaku Ikeda's Curriculum of Soka Education: Creating Value Through Dialogue, Global Citizenship, and 'Human Education' in the Mentor-Disciple Relationship". Curriculum Inquiry. 42 (1). ↑ Editors (3 February 2015). "No More Nukes". Tricycle. Archived from the original on 18 February 2015. Retrieved 19 February 2015. ↑ Daniel Métraux (2013). "Soka Gakkai International: Japanese Buddhism on a Global Scale". Virginia Review of Asian Studies. ↑ Clark Strand (Winter 2008). "Faith in Revolution". Triycle. Retrieved 19 February 2015. ↑ 6.0 6.1 6.2 6.3 6.4 Olivier Urbain (2010). Daisaku Ikeda's Philosophy of Peace. I.B. Tauris. ISBN 978-1-84885-304-1. ↑ "Timeline of Daisaku Ikeda's Life". daisakuikeda.org. Retrieved 4 February 2016. ↑ "Daisaku Ikeda CV". daisakuikeda.org. Retrieved 4 February 2016. This article includes content from Daisaku Ikeda on Wikipedia (view authors). License under CC BY-SA 3.0.